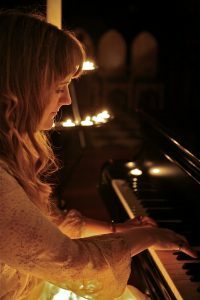 Phamie Gow studied with concert pianist and composer, Ronald Stevenson before completing a degree at the Royal Scottish Academy of Music and Drama (RSAMD) in Glasgow, Scotland. Stevenson, friend of Schostokovich and expert on Busoni was crucial to the development of Gow as a pianist and composer. Phamie Gow’s love of nature, her interests in poetry, art and the visual world around her, an appreciation of the lyrical and poetic, her sense of history and place, all thread through her work. Compositions can be simple yet profound, possess both dignity and innocence, show strength and fragility but are always melodic and memorable. Gow creates atmospheres and paints pictures in your mind and has variously been described as conveying ‘an atmospheric balance between spontaneous feeling and stately gravitas; music which is ‘haunting’ and ‘a clearly defined musical palette that’s intelligently and sparingly used’. While still a student Phamie performed in a solo concert in the Main Auditorium of the Royal Concert Hall in Glasgow opening for the poet, Seamus Heaney. By the age of 19, she had released two albums, ‘Winged Spirit’ and ‘Lammermuir’ where her compositional skills came to the fore and she gained recognition as a composer comparable to Richard Rodney Bennet and Benjamin Britten, the comparison only emphasizing the maturity of her work. ‘Lammermuir’ was described as ‘an album of extraordinary beauty and grace’ by Robert Weir of Sing Out Corporation.